Your Guide to Real Estate on Tybee and Savannah’s Eastern Islands! Tybee Homes is dedicated to making your search for properties in the area as easy as possible. We are here to provide our customers with a detailed resource on real estate primarily on Tybee Island, but also the Eastern Islands of Chatham County. In addition to the printed version of the Tybee Homes, TybeeHomes.com has an online version, which is mobile-friendly. 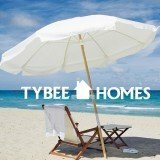 For more information on Tybee Homes Magazine, take a look at our media kit below.